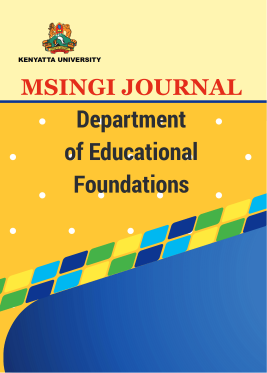 Msingi Journal is a biannual international peer reviewed journal published by the Department of Educational Foundations, Kenyatta University, Kenya.The aim of Msingi Journal is to provide scholars a forum for discussion on various educational issues both in Africa and Internationally. Elizabeth N. Mutisya, Theresia K Kinai, Dr., Jotham N. Dinga, Dr., Samuel M. Mutweleli, Dr. Relationship between Parental Marital Status and Students’ Academic Performance in Day Secondary Schools of Dagoretti Sub District of Nairobi County, Kenya.